Local government departments or individual landowners involved with managing regional infrastructure such as unpaved roads. Local schools and youth programs such as 4-H who learn through our natural resource education activities about how to steward the water, air, and land of the places they call home. Individual citizens looking to improve their communities by cleaning up polluted waterways or by being involved in supporting the habitat of a treasured animal species such as the gopher tortoise. Landowners interested in effectively stewarding their forestland to support native species and enhance the local ecological diversity. Through these and other similar outreach and educational events, Golden Triangle serves as a vehicle for effective community education programs that improve quality of life for all citizens. A list of recent programs is below. In July 2017, Golden Triangle joined a handful of other presenters at the Stripling Irrigation Park in Camilla for the Youth 4-H “H2O camp.” The camp was attended by 4-H clubs from around the region with a total of around 70-80 students. Along with a handful of other presentations covering various aspects of the uses, conservation, and importance of water, Golden Triangle engaged the kids in Watershed discovery activity. Through Julie Shutters engaging and entertaining approach, students learning about how a watershed functions and can get impaired. Through a interactive activity and painting a mural, students brainstormed about solutions and discovered ways they can begin to make a difference for water quality in their communities. Golden Triangle is actively pursuing expansion of its Youth Nature Education program under the project name “Natural World Discovery Youth Environmental Education Program”. This program aims to improve appreciation for area natural resources among local schoolchildren. 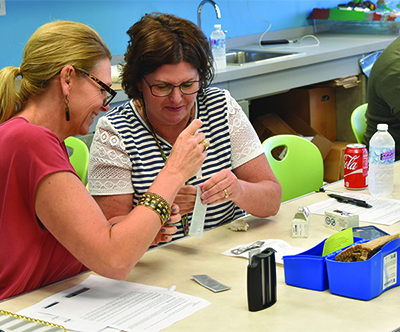 Through engaging and interactive presentations for students and exceptional tailor made training programs for teachers, the program is empowering local students to be tomorrow’s innovative natural resource stewards. Their wise stewardship is vital for the ongoing survival and success of the rural communities of southwest Georgia. Through presentations in local schools and youth programs such as 4-H, students learn through our natural resource education activities about how to steward the water, air, and land of the places they call home. We have applied for a handful of grants to further the project and are developing partnership relationships with other nature education presenters. These include UGA’s Dr. Nick Fuhr-man, (aka, “Ranger Nick”) and Georgia Pacific’s Forester. In partnership with Georgia Pacific, we’re anticipating presentations throughout this school year at Miller and Seminole area county schools. We also anticipate some programs with Ranger Nick in Early County, thanks to potential forthcoming funds through Golden Peanut’s parent company, Archer Daniels Midland. Golden Triangle RC&D conducted a training workshop on September 26th for Flint Riverkeeper volunteers for Water Quality Assurance/Quality Control certification (QA/QC) through the Georgia Adopt-A-Stream Program. Golden Triangle’s Julie Shutters is a qualified instructructor in this program, enabling us to offer certification workshops in this bacteria & chemical water testing program. This training is valuable not only to community volunteers with river groups like Flint Riverkeeper, but also landowners and anyone involved with managing water resources. This workshop was also attended by Dr. Andrew Schiavone of the Regenerative Agriculture Program at Andrew College in Cuthbert. At Golden Triangle Regional Conservation and Development Council, our mission is to assist the residents of our area in achieving sustainable development while enhancing human and natural resources.